My favourite holiday treat for the last few years has been candy cane peppermint bark. Costco makes a really good version, but you can buy it from basically any bakery or chocolate shop, or prepackaged in many stores. It is made from white and milk chocolate, mixed with peppermint extract and candy cane chunks, hardened in thin layers and then broken into smaller pieces. It’s so simple and so delicious. It’s a holiday staple. Unfortunately, it’s also full of refined sugars that are bad for your skin, teeth, and digestive functioning, among other things. I believe in moderation, and that unhealthy treats are okay once in a while, especially around the holidays. But I like candy cane peppermint bark. A lot. I often want to eat the whole box of it. That means I needed a healthier version of this delightful treat that is guilt-free. After a couple of tries, I nailed what I think is a tasty, better-for-you recipe for candy cane peppermint bark. It still features chocolate and the distinct peppermint favour– keep reading to learn how to make it yourself! You’ll need plain (or vanilla if you don’t mind the added sugars) greek yogurt or cultured coconut. I went for greek yogurt since it’s more affordable and easier to find in Newfoundland. 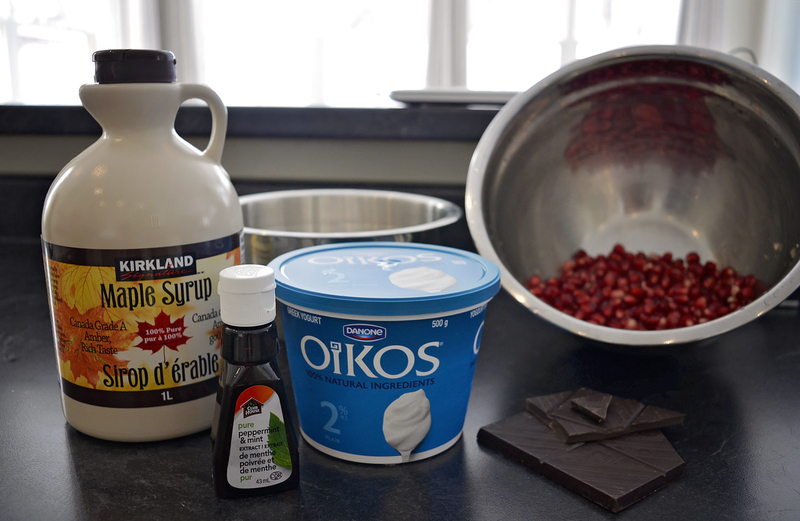 You’ll also need peppermint/mint extract, pure maple syrup, dark chocolate, and pomegranate seeds. Start by melting down the chocolate in a double boiler (this will keep it from burning on). Meanwhile, combine 3 cups of yogurt with 1/3 of a cup of maple syrup, stirring until smooth. Add 1 teaspoon of peppermint extract to the yogurt mixture, 1/4 teaspoon to the chocolate, and toss 1/4 teaspoon with the pomegranate seeds. Next, spread out the yogurt mixture on a baking sheet lined with parchment paper. Drizzle on the chocolate and, if you want to, mix it through. Top it with as many pomegranate seeds as you like, pressing them down into the yogurt with your fingers or the back of a spoon. Place the tray in the freezer for a few hours or overnight. And there you have it! Of course, this recipe doesn’t taste exactly like traditional candy cane bark, but I really like it. It’s light, sweet, and the pomegranate seeds add a level of freshness. It doesn’t leave you feeling icky and bloated after you’ve eaten some. I like this replacement for a classic Christmas treat, and I hope you do too! Let us know if you make some yourself and send us your photos on Instagram or Facebook, @twowildtides.